We come across many bugs while testing Android apps. These bugs can be of many types such as UI, usability, functional etc. But none of them are as nasty as app crashes. And ANRs (App Not Responding). They tend to hamper the user experience and drive users away from our app. That’s why as testers, we should keep a tight track on these bugs. Bug Radar is a nice little Android app which helps us do just that. This article shows how we can use it while testing our Android app. So let’s start with its introduction without wasting any more time. Bug Radar is a free Android app. As its name suggests, it monitors installed Android apps for any crashes and ANRs. When an app under test crashes or stops responding, it notifies you in a notification center. Not only that. It also captures error stack trace and device details. You can then share these details via email. In case you don’t want to share it via mail right away, you have an option to share it later. All the bug reports are stored in device’s internal storage in ‘Bug Radar’ folder. Apart from this, below are some salient features of this app. It is free to use and doesn’t contain ads. It doesn’t require root access. You should be able to use it on Android version 4.0+. It’s light weight. In our day to day use, it didn’t eat up more than 4 MB of memory. Also, it only took 352 KB of storage. All these nifty features makes Bug Radar a real great addition to any software tester’s tool set. And with all these features, it’s simple enough to use, as we’ll see in following section. 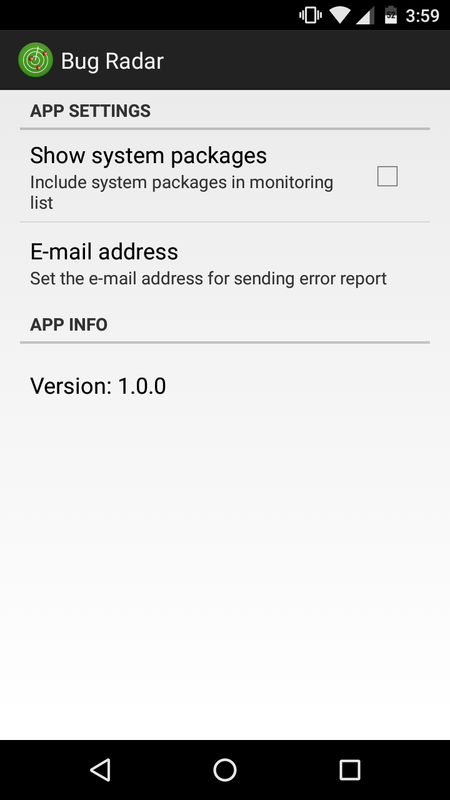 Install Bug Radar from Google Play Store. When you open it, it shows all the Android apps installed in your device. Select the app you want to monitor and tap Start option. Bug Radar will now start monitoring the app. In case you want to monitor all the apps, just tap Start without selecting any app from the list. Whenever the app crashes now on, Bug Radar will show you a notification. Tapping it opens an email with error stack trace and device info. You can then send that email or choose to share these error details later. In case you want to change the recipient of the mail, you can do so from Settings. There is also an option to show system apps in Settings. 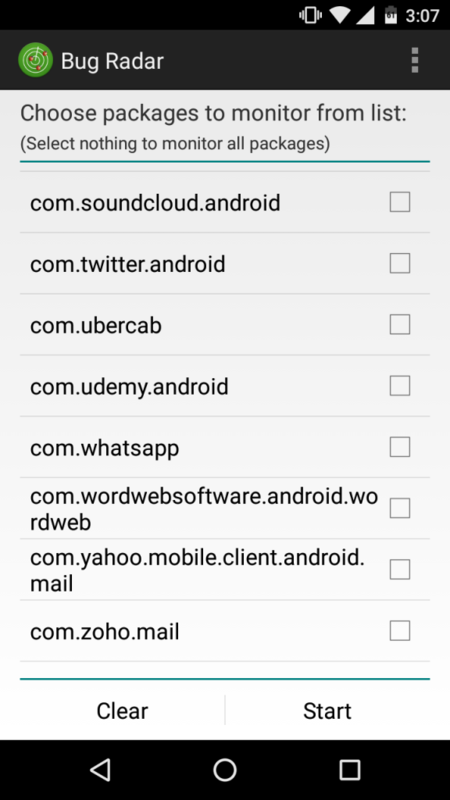 Check this if you want to monitor Android system apps as well. There is also an other way we can share the captured errors. Bug Radar stores all the error reports in device’s internal storage. You can find them under ‘Bug Radar’ folder. All in all, it’s a great tool for Android apps testing. Since we should always test mobile apps on the move, it makes perfect sense for us to use it. I have been using it to test some Android apps lately and found it immensely useful. Albeit with a single gripe. I was not able to select only one app for monitoring. Somehow it would uncheck the check box I’ve selected for the app. But I was able to use it for all apps fine. In any case, I recommend you give it a try for your project. And once you do, don’t forget to share your feedback in comments. I am not getting this app anywhere now. can you please provide any link to download.